Among the many additions made by the recent Manniversary update for Team Fortress 2, the Steam Workshop may well turn out to be the most important. The Workshop is a hub that lets community item creators show off their creations so that they can be rated by other players. The best ones rise to the top, where they can be cherry-picked by Valve for inclusion in the game. If you haven't had chance to browse some of the community-made items vying for dominance, it's well worth doing so. We've picked out some of our favourite items, including an umbrella-gun for the Spy, a beserk rocket launcher for the Soldier, and a couple of wonderfully mad Engineer packs. The Mobile Sentry Gun is deservedly the very highest rated item on the Steam Workshop right now. 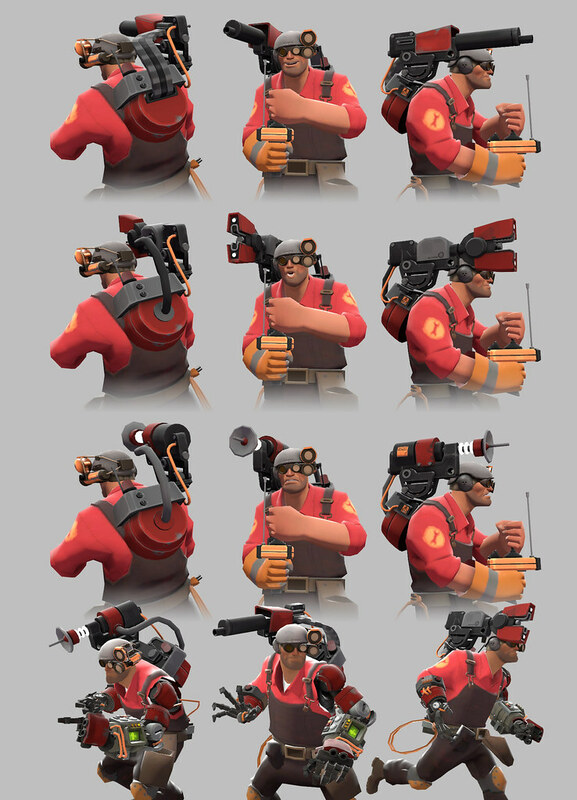 The model for the Engineer's shoulder-mounted cannon is fantastic, but it also forms part of a larger pack that includes designs for a number of different shoulder cannons , and a bionic hat made up of infra-red vision equipment. The physics of the Bird's Eye Bomber don't make any real-world sense, but it's just the sort of mad contraption you could imagine the Soldier endorsing enthusiastically. The idea is that a secondary rocket can be fired downwards for easy rocket-jumping, and to bombard foes below as you fly overhead. Perfect for Soldiers obsessively seeking air superiority. The best part of this inventive pack gives the Spy a gun hidden inside an umbrella. For some reason the vision of a Spy running around with an umbrella just works, and it gets even better when you discover that the Spy can open it up to break long falls. Watch this video of a Spy doing just that. It's like Mary Poppins. If Mary Poppins was French. And a trained killer. Nothing suggests mad science more effectively than a brain in a jar. The Frankenstein Curios pack for the engineer contains a fantastic sentry gun powered by one such brain . Items are submitted to the Steam Workshop without rules attached. When Valve adopt a new weapon, they decide how it will work in a way that hopefully won't unbalance the game. That leaves the doors wide open for speculation on this one. What attributes would you give to a sentry gun that has a brain? There's also a brain-powered shotgun and a Mr. Freeze style dome helm that makes the Engineer look genuinely quite menacing. See for yourself in this video of the pack in action. These items should nicely fill the extra spare accessories slot that Valve added in the latest update. They wouldn't necessarily have any effect on the game, but who's pass up on a chance to carry around a pair of Spy voodoo dolls ? There's a hilarious moustache for the Heavy . We're unsure whether it's supposed to turn him into Stalin or Freddie Mercury, but damn, what a 'tache. Have you had a chance to browse the Steam Workshop? Got any favourite items of your own? Can you think of any good rule-sets for the items above? Let us know in the comments.